Update: Respawn has issued a fix for the account reset issue introduced in update 1.1. Evidently, the bug was caused by a simple server discrepancy. After downloading the update, players were mistakenly put onto the wrong servers which didn't have their progression saved, so naturally, nothing showed up on their accounts. So, there you have it. Crisis averted. Phew! A serious bug in the latest Apex Legends update may totally reset your account if you so much as log in. Developer Respawn Entertainment says it's aware of the issue and is working on a fix. In the meantime, the developer recommends players "do not buy or craft anything," but quite frankly, you probably shouldn't download the update or try to play the game at all. I'd say stop just short of quarantining your entire gaming setup behind yellow tape. Players have already posted and filed hundreds of reports on this issue, all of them sitting at clean-slate level one without any unlocked items such as skins and battle pass rewards. Of course, even if progression items were available on the reset accounts, we're still talking about a near-total account wipe. I imagine a blue Wingman would be small comfort to enthusiasts whose trackers are back at square one. Given the severity of this bug, Respawn will likely roll back Apex Legends to its most recent backup, and either patch or re-issue today's update. In an ideal world, that will totally undo today's bug without shaving off much progress from the past few days or weeks. The servers have been shut down to prevent more accounts from being compromised, but Respawn hasn't issued an ETA for a potential fix. We'll update this story as more information becomes available. 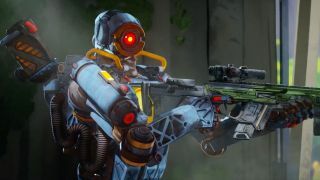 The sky isn't falling just yet, but just in case you need this, here's our guide for how to level up fast in Apex Legends.